A quiet day in many respects, and certainly as far as the weather is concerned. It was calm, and grey and warm all day, and this brought with it the inevitable swarms of midges – thankfully of the non-biting variety. Out in the loch, the fish clearly loved the new arrivals. In the trenches, a pall of cloyingly-fragrant air signaled the application of a well-known skincare product, which is reputed to keep the midges at bay. It may, or may not, work but holding your breath when passing a well-plastered colleague is advisable. Over in the northern corner of the site, Hugo, and his team, continued to uncover ephemeral wall lines (most probably post dating the major phases of the site) which, it is fair to say, look a good deal more solid now. Later in the day, a notable find emerged from those walls. Hugo – who also, as it happens, is a lithics expert – found a stone tool which has thus far defied description, other than “stone tool”. It looks something like a long and elegant axe, although not polished. The puzzling thing is that the business end, which shows signs of wear as might be expected, is angled on one side and flat on the other. It has, in short, the profile of a file. All suggestions are welcome. In Structure One, Dan, and his team, are cleaning off complex floor deposits and working out what to remove next. 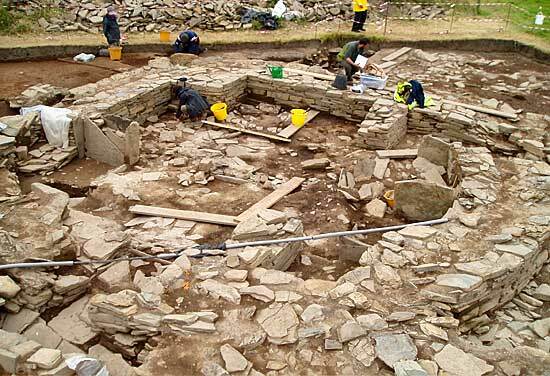 They also propose to clarify of what looks like a hearth in the southern half of the structure which, as we mentioned in an earlier diary, is already looking remarkably spacious due to the removed of the internal oval structure. Was this hearth part of the original plan of Structure One (when it closely resembled House Two at the nearby Barnhouse Settlement, which has two hearths) or was it a new insert relating to the remodeling of it when the internal area was greatly reduced by the insertion of a large curving wall – time and a lot of headscratching will tell! Ally is working again on the neat passageway between Structures One and the earlier phase of Structure Seven, in which she spent so much time last year, but will hopefully be able to clarify the relationship between the two. The passage is filled with rubble – is it collapse or deliberate blocking? Ally will provide the answer! Outside the entrance of Structure Twelve, Owen and his team have found what appears to be two almost-complete pots, positioned in a way which seems to suggest that they delineate the entrance in some way. It also seems likely now that the porch arrangement, which surrounds the entrance, must be outside the main structure rather than inside it. This may seem an obvious statement, but with Neolithic structures it is never wise to assume. Meanwhile, in the new extension, more of the surviving eastern outer wall face of Structure Twelve is being revealed. It now seems that more of this eastern wall may have survived the robbing revealed last year, than first thought. We are hopeful that now that all three piers on this side may be relatively intact and mirror the beauteous nature of the three piers on its west side – several of the large blocks in the west piers have been surface dressed by pecking. Can’t wait to see it revealed in all its glory! In Structure Eight, the areas exposed by the removal of roof tiles have been cleaned and recorded. The next stage is a repetition of the first – remaining roof tiles must be identified, tagged, photographed, described and logged, than lifted and stored with their details. It is a repetitive process, and one which leaves the diggers gazing longingly at the floor surfaces beneath the tiles. But they must not touch them – at least, not yet. As these slates are removed, more of the internal “fixtures and fittings” are also coming to light – hearths and whole series of upright slabs that divide up the internal area. These orthostats must have presented a veritable obstacle course to anyone entering as one had to negotiate ones path into this structure – as if one was being guided on a specific, predetermined route as seems common in many Neolithic structures. The next generation of new eager archaeologists at today’s Excavation Club. Today was also the first session of the Excavation Club that, as last year, is a joint project between the Historic Scotland Rangers and the Ness dig. As ever it was hugely over-subscribed, despite the fact that an extra session is proposed for this year. 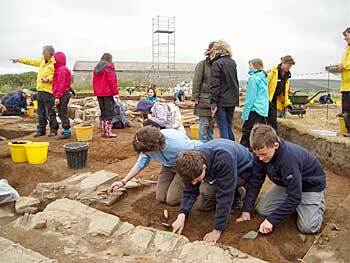 Eleven, very eager, school children attended, some of whom had had their summer holidays in Orkney arranged around the dig so that they could attend – all very heartening for us older generation of archaeologists to see that the future of our profession seems guaranteed! After a brief welcome from director Nick they were given an introduction to archaeology by Helen Woodsford Dean, who is assisting with the Club. Then straight into ‘dirt’ archaeology. Armed with an array of bright new shiny trowels they were closely supervised in their first encounter with real life archaeology. The standard and cleanliness of their trowelling would have shamed some more experienced archaeologist and soon after a few false starts were recognizing an array of finds with notably several very fine sherds of pottery being recovered. We think this won’t be the last we see of some of these fine new archaeologists. Thanks again to Sandra, Elaine and Keith, the Historic Scotland rangers, for making this possible. 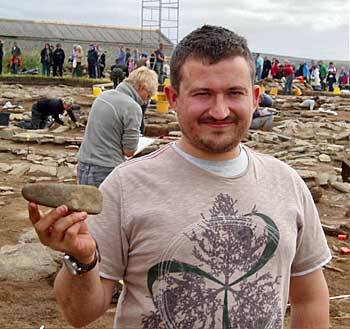 Occupation: Student at Orkney College branch of UHI, doing Scottish Cultural Studied Degree. Before Monday, I have never worked on an excavation. Coming in with no experience was a bit nerve-racking but I was quickly swept up in the excitement of the site. Part of my reason for choosing to study in Orkney was because I feel so highly privileged to have the chance to work on the Ness. I am have also been amazed by the amount I have learned since I have started. Just working on site gives a great insight into archeology that cannot be achieved by any amount of reading or lectures. For the better part of the two weeks of my time on the Ness, I have been working primarily in the north-east corner of the site, which has remained unexcavated since it was uncovered in 2008. Our starting point was what looked like the top of a wall with a line of upright stones running parallel to the wall suggestive of orthostats which could form a storage space against the wall. 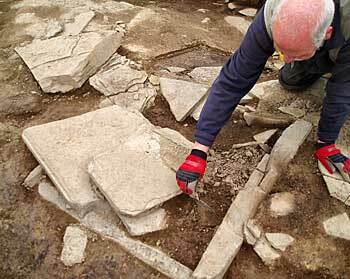 We began to try tracing the wall, hoping it lead us to other linking wall and uncover enough to identify a new structure. We quickly found that wall disappeared only a short way from were we started and we switched to taking down sections in what we hoped might be the interior side of the wall. 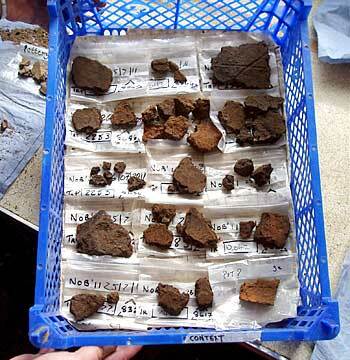 The first several inches had a fair density of pot and bone fragments, but as we excavated lower the number of finds decreased revealing a large amount of rubble surrounded by clay. This may suggest that the building was filled intentionally when it was still a complete structure. The most recent development is the large flat stone lying horizontal which might be another collapsed orthostat off the building. We are still hoping that further excavation will reveal a more coherent structure of some sort, though of what type and how complete it will be is hard to say at this point. Fingers crossed!